“Some hotels are iconic legends in the city they call home. The Ritz is Paris, Claridge’s is London, the King David is Jerusalem…and the Adlon is Berlin." Originally opened by the Kaiser in 1907, the Adlon fast became the social hub of Berlin and a must for moneyed visitors. It was the world’s first hotel with a private bathroom for every room. Charcoal-broiling steaks was invented at the Adlon. Grand Hotel, the 1932 movie starring Greta Garbo, Joan Crawford and John Barrymore was “set” at the Adlon. Located next to the Brandenburg Gate and the American, British and French embassies, the hotel survived both World Wars, but was destroyed by fire in 1945. 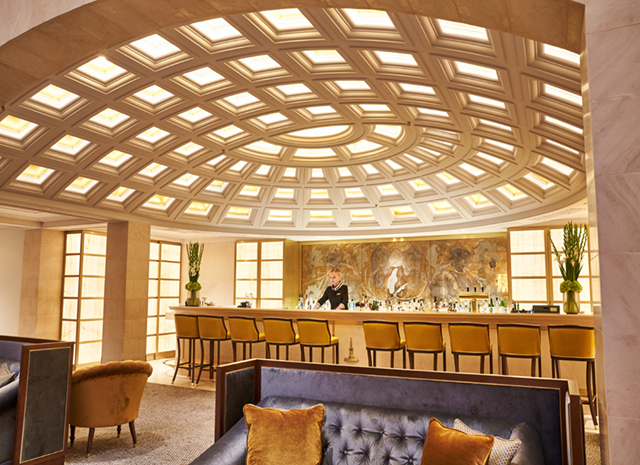 The new Adlon opened in 1997 – nine years after the Berlin Wall came down – and, just as it had 90 years earlier, instantly became the hub of Berlin, and the home-away-from-home of monarchs, diplomats and celebrities. The elegant design of the Adlon, which recently unveiled a completely redesigned lobby, recalls the original, and most of its ultra-luxurious rooms and suites face Berlin’s most iconic sites – including the Pariser Platz and Brandenburg Gate, Unter den Linden (the Champs Elysées of Berlin) or the haunting Memorial to the Murdered Jews of Europe. The hotel’s many restaurants include the Michelin-starred Lorenz Adlon, the all-day Quarré (which spreads into Pariser Platz in the summer), the pan-Asian Sra Bua by Tim Raue, and the lobby lounge and bar. The Adlon also has a large swimming pool, health club and spa.